PDF Files to help your training! The goal is to teach the dog to recognize and focus on the signal for the correct jump and wait for “jump” command/signal. Once commanded, the dog should go in the correct direction to the indicated jump. Lastly, when landing, the dog should look for and come directly and quickly to the handler. First set up your jumps. You may use two bar jumps or 2 high jumps or one bar and one high jump. 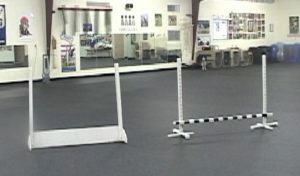 (Note: you will need to practice the ring set up of a high and bar jump BEFORE showing your dog.) Set the jumps low 4-8″ and place them 6-10 feet apart. Introduce your dog to the jumps if he has never jumped before Build value for the jumps by making sure your dog can jump the jumps from any angle (starting at low jump height) or distance away from the jumps. The arm you use will coincide with the side the jump is on. Your signal starts with your arms at your side. Your signal hand turns to face your dog and then your arm will come from your side upward to shoulder height and return to your side in one motion. Before you begin, think about the commands and signals you will use while teaching your dog. The command to jump each jump (bar and high) should be different from each other. Examples: the bar jump command could be “bar” and the high jump “hup”. Level 1: Begin with visible treats or toys in both hands. Place your dog on a sit centered between and about 10 ft. from the jumps. Walk to the other side of the jumps and opposite your dog about 10 ft. away from the jumps. Move slightly towards the jump you want you dog to jump. Give the appropriate jump command and hold your hand out so the dog can see the treat/toy. Keep your hand out so that your dog can get the treat/toy after he has jumped. Your hand/signal remaining up will help your dog identify that the signal is associated with the correct jump. Praise and reward your dog when he commits to the correct jump and reward him with the treat/toy after he jumps the jump and comes to you. Repeat to the other jump. Be sure to include READY SET GO games to keep your dog’s attention on you as you leave your dog. There is no front at this level of training. NOTE: As your dog begins to understand that the signal means to take the jump, begin each repetition closer to the center line (between the jumps and about 10 feet beyond them). Be sure to include READY SET GO games to keep your dog’s attention on you as you leave your dog. Level 2: Moving jumps away from each other. Once your dog understands the concept of which jump to take, gradually start moving the jumps further apart. Only cease having a visible treat/toy in your hand once your dog is confident. (Each time your dog jumps and comes to you, reward and play. DO NOT add fronts. Also, begin to bring your hand back to your side after your jump signal is given. Be sure to include READY SET GO games to keep your dog’s attention on you as you leave your dog. Level 3: While you and your dog are still positioned close to the jumps, and the jumps are still at a a very low height, move jumps FAR apart (about 30-40 ft). This will teach your dog that he should take the direction and the jump you have indicated. It will also teach your dog to “LOOK” for the jump. Gradually make distance between jumps extreme (60 – 100 feet). Also start introducing Cross-jumping. This is where you place your dog in front of one jump yet send to the opposite jump. Adding Fronts: When starting to add fronts to this exercise use your verbal front command once your dog has cleared the jump and as your dog is approaching you. Gradually diminish the use of the verbal command. ALWAYS continue to randomly add the READY SET GO games to keep your dog driven and enthusiastic about the Directed Jumping skill. REMEMBER – anticipation is a GOOD thing! It tells you that your dog understands what you want. Now you just need to teach him to wait until the command is given. Alternate the Sit-stay with the Jump command. Anytime a dog refuses to jump always check for health issues or eye problems. If your dog checks out, go back and work on the “Ready, Set, Go” games. This will make your dog eager to jump. • Put your dog back and move closer towards the jump he is to take. • Bring the jumps closer together. • Keep the treat/toy in your hand for a few more training sessions. Once your dog understands the directed jumping concept, start proofing. Remember that if your dog has trouble, simplify the proofing. The following are some proofing ideas from “Success is in the Proofing”. 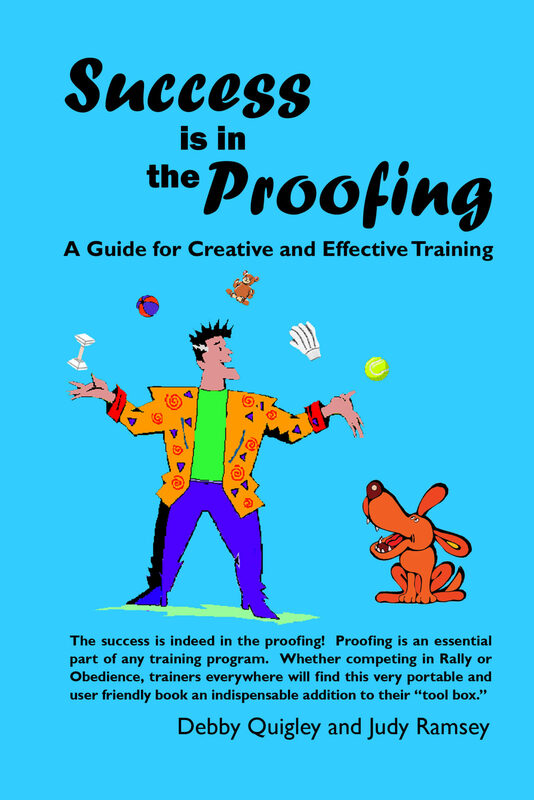 The book covers the how to’s and why’s of proofing for all levels from Novice to Utility. Cross jumping. Place your dog in front of one jump and ask them to jump the opposite jump. Remember: When adding go-outs to Directed Jumping, start your proofing at an easy level and increase as your dog gains confidence. Note: if your dog makes a mistake, mark the error and show your dog how to be correct. Start with easy proofing and gradually add difficulty as your dog becomes a STAR. Give your dog praise and encouragement during training. Training is fun and if your dog sees it as a fun game, he will be more likely to perform well for you in the ring. • Keep your training sessions short. Your dog will become bored very quickly, so train in short and frequent sessions. • Do not jump a young dog too often or before their growth plates have closed. Developing puppies are prone to permanent lameness and injury if they are worked too hard while young. • Don’t train on the Directed Jumping during adverse weather. Mud or other slippery ground conditions can make it very tough for your dog to get proper traction and stability.